Even before Oprah's recent report put industry farms in the spotlight, urbanites have been cutting out Big Chicken by way of a growing backyard poultry movement. A small flock provides a steady source of local eggs while the chickens consume food scraps, provide fertilizer, and peck at pests and weeds. City laws vary regarding pet chickens. Bans on roosters are common, but hens will produce (unfertilized) eggs even in the absence of a rooster. 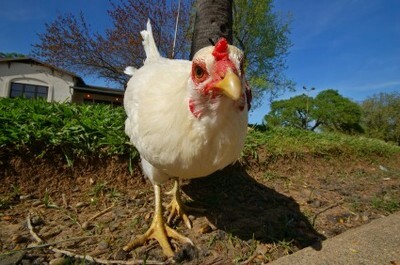 The City Chicken has compiled a list of urban chicken laws. Chicks raised with frequent human contact will be tame, but more experienced farmers might opt for the challenge of adopting adult birds. Farm Sanctuary finds homes for animals that have been rescued from inhumane food production operations. Backyard Chickens offers tips on raising, feeding, and hatching chickens. Have you joined the urban chicken movement? Share your stories and tips!